I live in Petoskey and I started out as a client of Dr. Thorps as she was my veterinarian for our horses, lambs, and pigs. 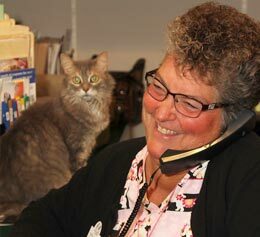 I started working for Dr. Thorp in 2007 as a kennel assistant, and then went to work for her as a full time receptionist in 2009, which I truly enjoy. I have had a love for animals all my life. I am married to my wonderful husband Craig, and have a daughter Kelsey and her husband Paul and son Cameron whom I totally adore. With Kelsey married and out of the house now we have our family of pets which we cherish and love. Sadie is an 8 year old Collie, and Chloe is a 4 year old Pug. We also have 2 cats named Josie and Flower Socks. We enjoy camping, boating and snowmobiling. I am a 4-H leader, on the Emmet county 4-H Council, and am on the Emmet/Charlevoix County Fair Board. I love monster trucks and dirt track racing, and am a member of the First Christian Church.